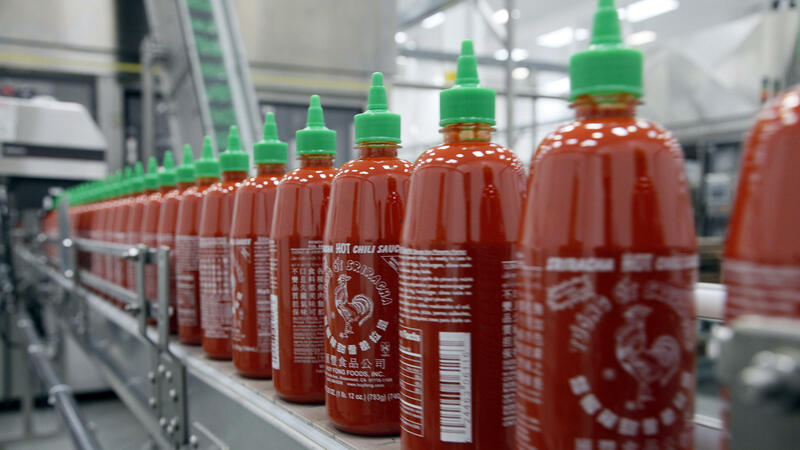 Sriracha chili sauce is produced at the Huy Fong Foods factory in Irwindale, Calif. CEO David Tran has been at odds with the local City Council over the smells emitted by the sauce factory. "Today, I feel almost the same. Even now, we live in [the] U.S.A., and my feeling, the government, not a big difference," Tran says. Irwindale's city attorney, Fred Galante, says the city loves having the cult condiment factory but must pay attention to the health of residents. "It's difficult to tell a resident that suffers from asthma or their child that suffers from asthma, 'Sorry, we do not want to be considered business-unfriendly; just keep your child indoors,' " Galante says. It's a tough call, because Sriracha is a glamorous commodity. Bon Appetit named it one of its favorite foods last year. Chiliheads began to hoard it when it looked like Huy Fong might be forced to stop making it. Food writer Andrea Nguyen says Huy Fong Sriracha appeals to a certain palate. "For people who are seeking to turn their bland food into bold food very quickly, the Huy Fong stuff will definitely do it," Nguyen says. The Huy Fong stuff is now an $80 million business, made in a 600,000-square-foot plant. Tran designed the plant to be self-sufficient. The peppers are ground here and stored in huge plastic tubs manufactured on-site. The sauce is mixed and bottled on-site. Even the machines are repaired on-site. Sitting in his conference room, where a credenza displays the three chili sauces Huy Fong makes, Tran refers to the plant he designed to his specifications as his "loved one." And he's wounded that Irwindale's government is finding his loved one not so attractive anymore. But there are other suitors. Since the rumble with Irwindale, almost two dozen cities have urged Tran to relocate to their part of the country. For a while, he actually considered it. Galante says the problem can be fixed, and he hopes it doesn't come to a move. "We continue to try to work this out informally," he says. And after thinking it over, Tran has decided to stay in his Irwindale factory. He has lived in California for more than 30 years, and he says he's not planning to move. But he might open another site, outside Southern California. An additional location would allow him to keep up with the ever-growing demand for Sriracha and develop an added source for peppers, in case climate change threatens his current supply. There is also the allure of less regulation. On Monday, Texas state Rep. Jason Villalba is visiting with a contingent of business and agricultural people to urge Tran to consider expanding to the Lone Star State. Soon they will be countered by Rep. Tony Cardenas, who'd like to keep the business in Southern California, if not his San Fernando Valley district — all promising to do right by Tran's loved one. We have an update now on the fight between Irwindale, California and the makers of Sriracha hot sauce. Residents in the city complain the hot sauce factory, owned by David Tran, is emitting spicy and harmful odors. The fight here involves suggested fixes and legal action. Other cities have also invited Tran to move his factory there. NPR's Karen Grigsby Bates, from our Code Switch Team, has this report. KAREN GRIGSBY BATES, BYLINE: Huy Fong Foods CEO David Tran says he escaped from Vietnam almost 35 years ago to be free of the communist government there and it's many intrusions. DAVID TRAN: And today, I feel almost the same. Even that now we live in USA but my feeling, the government, not a big difference. FRED GALANTE: It's difficult to tell a resident that suffers from asthma or their child that suffers from asthma, sorry, we do not want to be portrayed as business-unfriendly, you know, just keep your child indoors. BATES: That's Irwindale's City attorney, Fred Galante. He says the city loves having the cult condiment factory but must pay attention to residents' health. It's a tough call because Sriracha is a glamorous commodity. Bon Appetit named it one of its favorite foods last year. Chilieheads began to hoard it when it looked like Huy Fong might be forced to stop making it. ANDREA NGUYEN: For people who are seeking to turn their bland food into bold food very quickly, the Huy Fong stuff will definitely do it. BATES: The Huy Fong stuff is now an $80 million business, made in a 600,000 square foot plant. BATES: You have to tour it by golf cart and staffer Sabrina Martinez does the honors, stopping along the way by the steel hoppers that grind the chilies a couple hours after they're harvested. SABRINA MARTINEZ: During that time we're open 24 hours a day, six days a week, to process our chilies in a timely manner. BATES: Tran designed the plant to be self-sufficient. The jalapenos that made national news are ground here. They're stored in huge plastic tubs manufactured, like his signature bottles, on site. The sauce is mixed and bottled on site. Even the machines are repaired on site. Sitting in his conference room, where a credenza displays the three chili sauces Hoy Fong makes, David Tran corrects me when I ask if this plant he's designed to his specifications is his baby. BATES: Your loved one, OK.
BATES: And he's wounded that Irwindale's government is finding his loved one not so attractive anymore. But there are other suitors. Since the rumble with Irwindale, almost two dozen cities have urged Tran to relocate to their part of the country. For awhile, he was so angry he actually considered it. City attorney Fred Galante says the problem can be fixed and hopes it doesn't come to a move. GALANTE: We continue to try to work this out informally. BATES: And after thinking it over, David Tran has decided to stay in his Irwindale factory. TRAN: We're still here. I live in California 34, 35 year. I'm not planning to move. BATES: But he may open another site, outside Southern California. An additional location would allow him to keep up with the ever-growing demand for Sriracha. And develop an added source for peppers in case climate change threatens current his supply. And then there is the allure of less regulation. So today, Texas state representative Jason Villalba is visiting with a contingent of business and agricultural people to urge David Tran to consider expanding to the Lone Star State. Soon, they'll be countered by congressman Tony Cardenas, who'd like to keep the business in Southern California, if not his San Fernando Valley district - all promising to do right by David Tran's loved one. Chilieheads of America, you can exhale now.